ESXi on ARM/Raspberry Pi for vSAN Witness purposes or for? I was just catching up on a couple of VMworld sessions. One session that stood out to me was most definitely once again the session by Chris Wolf and Daniel Beveridge. I am not going to write up a full coverage of it, as it is mostly very similar to the session they did in the US which I posted about here. 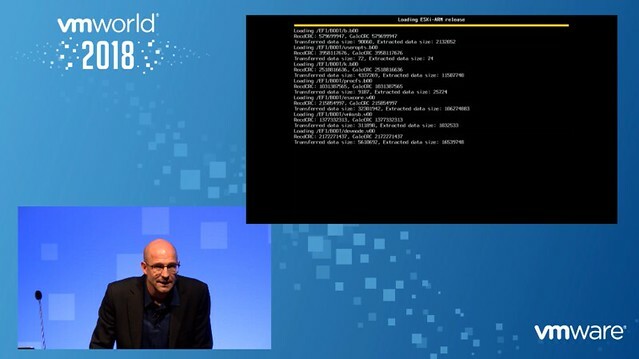 However, what is interesting in the European edition is that Regis Duchesne comes up on stage after about 38 minutes in and he starts discussing and demoing ESXi on ARM, but more impressively ESXi on top of a Raspberry Pi. Note that these machines have very limited memory (1GB) and little CPU (64-bit SoC @ 1.4GHz) resources, and are low powered! Gotta love an intro as well that includes “been at VMware for about 20 years”. Admission Control is always a difficult topic when I talk to customers. It seems that many people still don’t fully grasp the concept, or simply misunderstand how it works. To be honest, I can’t blame them. It doesn’t always make sense when you think things through. Most recently for Admission Control we introduced a mechanism in which you can specify what the “tolerated performance loss” should be for any given VM. This isn’t really admission control unfortunately as it doesn’t stop you from powering on new VMs, it does, however, warn you if you reach the threshold where a host failure would lead to the specified performance degradation. This is what you have today, nothing changes here. We use the static reservations and ensure that all VMs can be powered on! This is similar to the “performance degradation tolerated” option. We will look at the average consumed CPU and Memory resources, let’s say past 24 hours), and base our admission control calculations on that. This will allow you to guarantee performance for workloads to be similar after a failure. This is a static way of doing admission control similar to the first. The only difference is that here Admission Control will do the calculations based on the resources configured. So if you configured a VM with 24GB of memory, then we will do the math with 24GB of memory for that VM. The big advantage, of course, is that the VMs will always be able to claim the resources they have assigned. In our opinion, adding these options should help to ensure that VMs will receive the resources you (or your customers) would expect them to get. Please help us by leaving a comment/providing feedback. If you agree that this would be helpful then let us know, if you have serious concerns then we would also like to know. Please help shape the future of HA! Also very much enjoyed the book signing session at the Rubrik booth with Niels and Frank. I believe Rubrik gave away around 1000 copies of the book. Hoping we can repeat this huge success in EMEA. But more on that later. If you haven’t picked up the book yet and won’t be at VMworld Europe, consider picking it up through Amazon, e-book is 14.95 USD only. Various people have asked me, and I wrote about this before in several articles but as part of a longer article which makes it difficult to find. 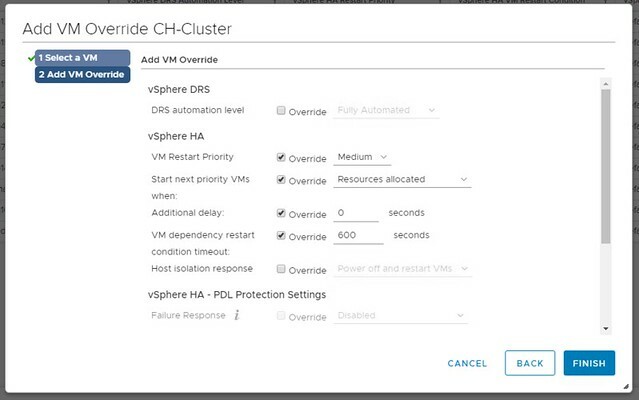 When specifying the restart priority or restart dependency you can specify when the next batch of VMs should be powered on. Is that when the VMs are powered on when they are scheduled for being powered on, when VMware Tools reports them as running or when the application heartbeat reports itself? In the UI you can specify how long HA needs to wait by using the option called “VM Dependency Restart Condition Timeout”. This is the time-out in seconds used when one (or multiple VMs) can’t be restarted. So we initiate the restart of the group, and we will start the next batch when the first is successfully restart or when the time-out has been exceeded. By default, the time-out is 600 seconds, and you can override this in the UI. What is confusing about this setting is the name, it states “VM Dependency Restart Condition Timeout”. So does this time-out apply to “Restarts Priority” or does it apply to “Restart Dependency” or maybe both? The answer is simple, this only applies to “Restart Priority”. Restart Dependency is a rule, a hard rule, a must rule, which means there’s no time-out. We wait until all VMs are restarted when you use restart dependency. Yes, the UI is confusing as the option mentions “dependency” where it should really talk about “priority”. I have reported this to engineering and PM, and hopefully it will be fixed in one of the upcoming releases.